Users with mobility impairments often rely less on a mouse to navigate computerized content, instead using the keyboard or another, more specialized input device(s), and therefore may require accommodations in order to access and comprehend a Web page’s content. Generally speaking, it is easier for motion impaired users to input data using a keystroke rather than by clicking a mouse. Whenever possible, a mouse alternative should be available in the form of text links, text-based wizards or keyboard shortcuts (such as in Flash). Custom keyboard commands should be overtly indicated on a Web page or within a menu. If mouse-click tools are implemented, the targets should be larger (e.g. a whole phrase), rather than smaller (e.g. a single word). NOTE: You should not necessarily implement these accommodations through hidden KEYACCESS tags. Such a fix can disrupt the normal operation of assistive devices and screen readers. Keyboard accommodations should be overtly written out on the page or within a menu. 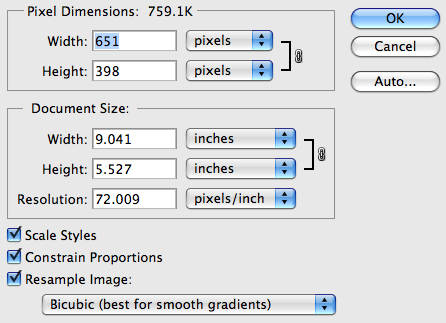 Photoshop lets you to enter numbers for image dimensions/resolution and to tab between fields to change image size. Users with a screen reader, since the device may not be able to see an interface well enough to aim a mouse to a tool or button. Users with carpal tunnel syndrome, or with certain forms of arthritis that limit manual dexterity. wrist who will need to rely on mouse alternatives for the duration of his or her injury. Those with neurological disorders that cause loss of fine motor control, such as Parkinson’s and essential tremor. Anyone learning to use a new mouse, trackball, joystick or other device (e.g. iPhone touch control).